When I last wrote about my decision to undergo personal genetics testing with 23andMe, I thought my results were still a month away. My sample had arrived at the lab, but the current wait time (by their estimate) was 4-6 weeks. Imagine my surprise this week when I got the e-mail that my analysis was ready. The ancestry stuff will take a few days longer, but my health risks were in. It was both scientific interest and personal curiosity that spurred me to get genotyped. To be fair, there was also a small part of me that worried about some hidden genetic risk. Intellectually, I knew that my family history is as predictive as anything of what diseases might be in store for me, and this was already an esoteric list including heart disease and cancer. Even, I couldn’t dismiss the possibility that there was something new to worry about. Mostly, I was interested in two things: BRCA1/2 mutations and APOE4 alleles, well-established risk variants for cancer and Alzheimer’s disease, respectively. For these and a couple of other conditions (e.g. Parkinson’s), the 23andMe testing can actually tell you something fairly concrete (and frightening) about your risk for devastating disease. You should probably talk to a genetic counselor, etc., etc. In every case I fearlessly clicked through and managed to unlock the entirely unexciting (if somewhat relieving) results. No common BRCA mutations, no APOE risk alleles. So I dodged the bullet on that one, and it was probably worth the cost — currently about $100 (affiliate link; see disclosure) — for me to find that out. Three nonsynonymous SNPs in the hemochromatosis gene (HFE) are genotyped, and I’m heterozygous for one of them. Luckily, this mutation often doesn’t cause disease, and when it does, it’s a mild form. The top SNP (rs1800562) is the big one; it accounts for over 80% of carrier chromosomes. It’s easy to imagine why 23andMe is marketing their tests as a family planning tool… if two would-be parents were tested, they might have an idea of conditions that could affect their children. If I had the more severe HFE mutation, and so did my wife, we’d know that our children had about a 25% chance of getting the disease (it’s recessive). Most likely, newborn genetic screening would pick that up shortly after birth, and we’d know for certain. And even had it happened, this seems like a condition that could be both managed (by diet) and monitored. Even though my results aren’t terribly exciting so far, it’s been a fascinating process. 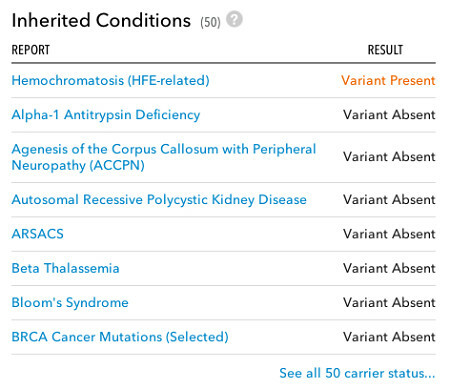 Perhaps the most impressive thing (aside from the earlier-than-expected results) is how careful 23andMe is about the information it provides. They inject notes of caution in language that’s probably very easy for a lay-person to understand. And they encourage talking to your physician or a genetic counselor, a good bit of advice that I hope most 23andMe participants will follow.